Welcome to our 2019 coverage of the ever-impressive Consumer Electronics Show in Las Vegas. 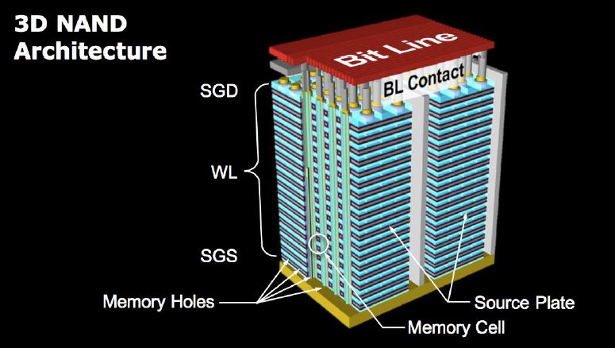 The first news to hit the pipeline is Toshiba announcing their BG4 series of ball grid array (BGA) solid-state drive (SSD). Toshiba’s ultra-compact NVMe™ SSDs pair both the flash and an all-new controller into a single package, creating design flexibility that is ideal for ultra-thin PC notebooks and embedded systems, as well as for use in data centers as server boot drives. 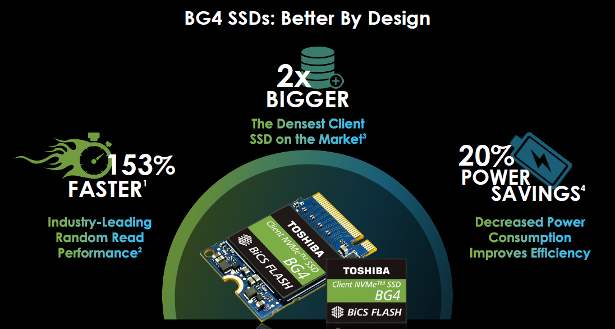 Featuring Toshiba’s innovative 96-layer BiCS FLASH™ 3D memory, the BG4 series increases maximum capacity from 512GB to 1024GB (approx. 1TB), and creates a slimmer 1.3 mm profile for capacities up to 512GB. 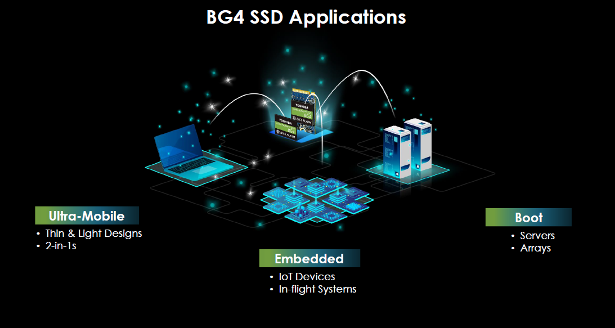 Additionally, the BG4 series and its all-new controller double the PCIe Gen3 lanes from 2 to 4, providing more performance within the same power range (as compared to the prior BG3 series). 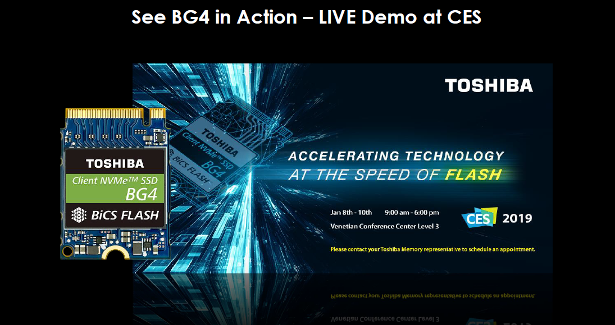 Toshiba’s new BG4 series upgrades sequential read speeds to up to 2250MB/s, and sequential write speeds to up to 1700MB/s, representing performance improvements of 50% and 70%, respectively (as compared to BG3 series). Random read speeds are upgraded to up to 380,000 IOPS, and random write speeds to up to 190,000 IOPS, again representing performance improvements of 153% and 90%, respectively. The BG4 series’ additional upgrades over the BG3 series include a power-saving solution that improves power efficiency by up to 20% in read and 7% in write, as well as providing a low-power state as low as 5mW. 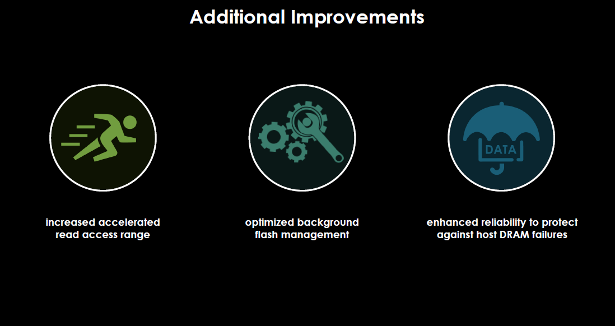 The BG4 also receives improved Host Memory Buffer (HMB) technology by increasing accelerated read access ranges and background flash management optimizations. The BG4 receives new enhanced reliability features as well, to protect against host DRAM failures when using the HMB feature. 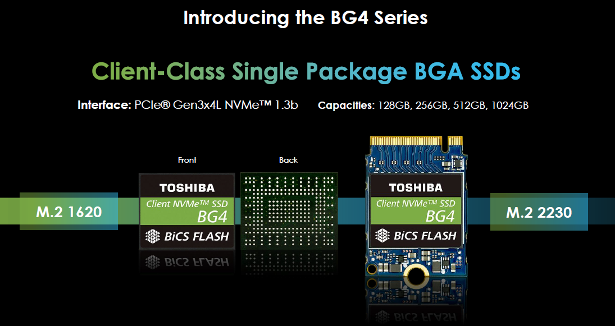 Toshiba’s new BG4 single package SSD is available in capacities of 128GB, 256GB, 512GB and 1024GB (1TB); in either surface-mount BGA M.2 1620 (16 x 20mm), or removable M.2 2230 (22 x 30mm) module form factors. Self-encrypting drive (TCG Opal version 2.01) models and Pyrite drive (version 1.00) models are also available. The BG4 series is currently sampling to select OEM customers, and general availability is anticipated for later in Q2 of 2019. Stay tuned for further news and updates as the TSSDR team explores the massive Las Vegas Convention Center and associated facilities housing 2019’s Consumer Electronics Show.